Love this. It's funny, my grandparents kitchen had their own version. On the wall where no wood like brown formica cabinets were hanging, they had a collage of peeled liquor, wine, etc. 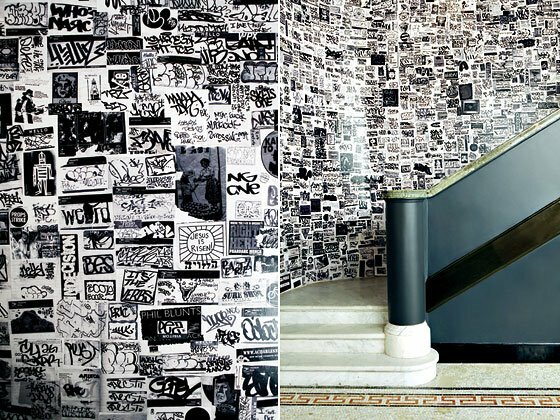 labels covering the entire wall. Funny thing, they aren't/weren't big drinkers. But yeah, I think it CAN be done well. And I'm sure you will do it well. I did this for my boyfriend in college. 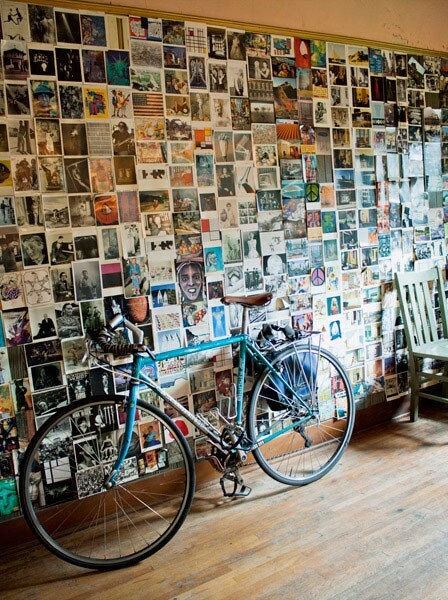 His room was so dreary so I took all of his old fishing mags and collaged. I loved it, it was so cozy! I'm all for your vanity being collaged! Do your vanity! And I love the rotating list. And do they ever rotate... I feel a bit nuts because of it. I've been thinking about this for my laundry room. My grandparents had a shower curtain and matching wallpaper in their bahamas bungalow in the 70s that was all vintage newspaper clippings--faux collage. That whole house was totally influential on me! 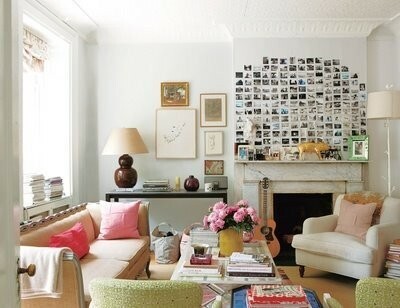 Haysus I want to marry that sofa and loveseat. That sounds like an expensive list, but selfishly I really want you to do it, because I know the result would be gorgeous! Amber I love the second image so fun! 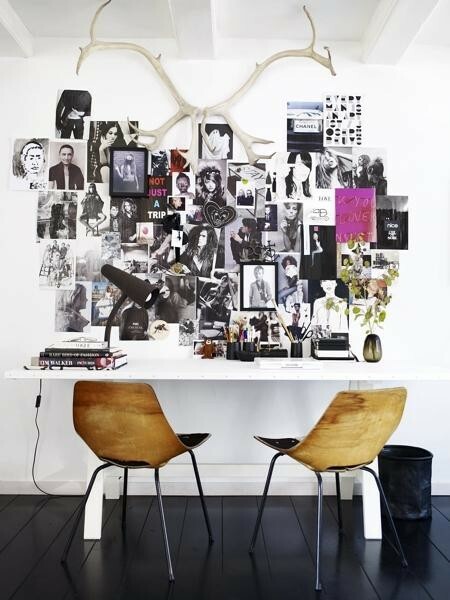 Some of the collage walls are just to busy for me though I adore an inspiration board chock full of images! Kind of like my bedroom circa 1986. 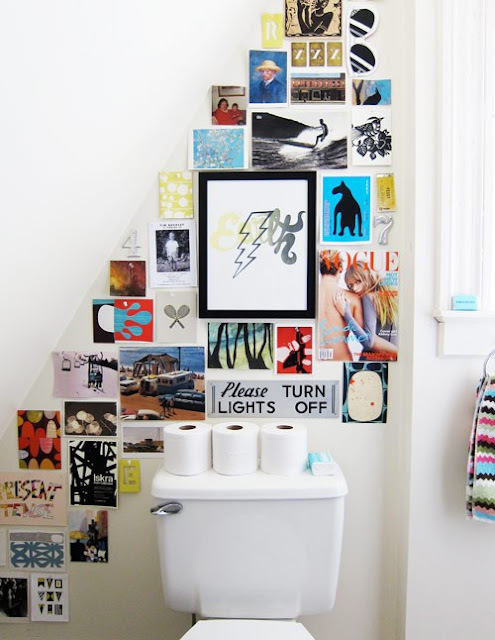 Loved clicking through your rotating list, some fabulous choice on there! I love seeing other people's to do lists. Is that weird? And holy hell — that couch. Oh and Ballard has new really really similar chairs for probably 1/100 of the price. 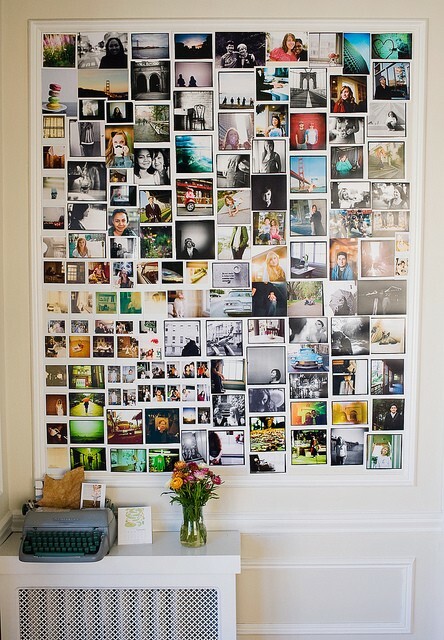 We had a polaroid wall in our last apt like the one above in apt therapy. My hubby specializes in polaroids so we always have a ton laying around! 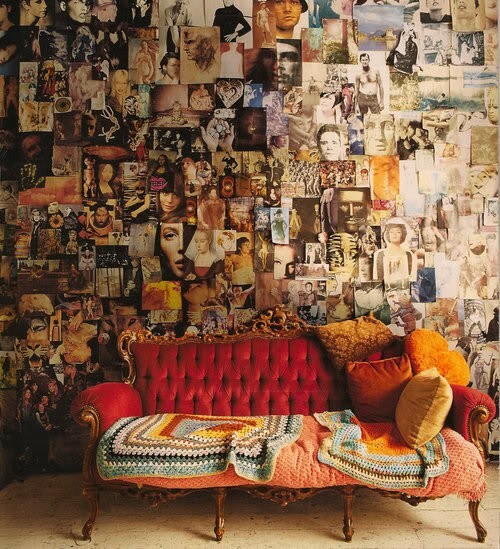 I was a collage wall fanatic in college. Still love it. Please get those chairs right now!